I seem to have skipped last year, but otherwise I have been to the DFN Workshop regularly. While I had a publication at this venue before, it’s only this year that I got to have a the conference. I cannot comment on the other talks so much, because I could not attend too many But our talk (slides) was well visited and I think people appreciated the presentation being a bit lighter than the previous one about the upcoming GDPR. I talked about PrivacyScore.org and how we’ve measured German universities. The paper is here. Our results were mixed. As for TLS deployment, with a lot of imagination we can see a line dividing Germany. The West seems to have fewer problems with their TLS deployment than the East. The more red an area is, the worse its TLS support is. That ranges from not offering TLS at all to having an invalid certificate or using broken parameters. As for tracking its users we had the hypothesis that privately run institutions have a higher interest in tracking its users than publicly run institutions. The following graphic reflects the geographic distribution of trackers on German university’s Web sites. That hypothesis can be confirmed by looking at the PrivacyScore list that discriminates those institutions. We found data that was very likely not meant to be there, such as database dumps or Git repositories of the Web site’s code (including passwords for their staging environments, etc.). We tried to report these issues to the Web site operators, but it was difficult to get hold of the responsible people. For the 21 leaks we found I have 93 emails in my mailbox. Ideally, the 21 I sent off were enough. But even sending those emails is hard, because people don’t respect RFC 2142 and have a security@ address. Eventually, we made the Internet a tiny bit more secure by having those Website operators remove the leaks from their Web site, but there are still some pages which have (supposedly) unwanted information such as their visitors’ IP addresses online. 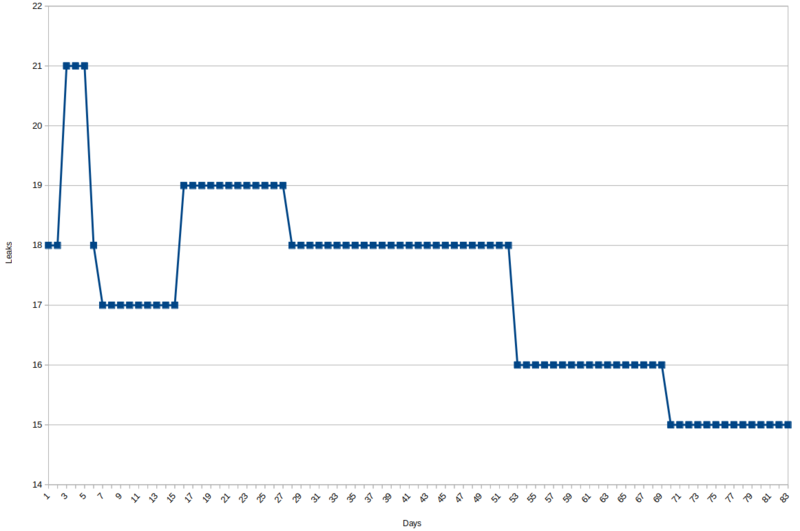 The graph below shows that most of the operators who reacted did so in the first few days. So management of security incidents seems to be an area of improvement. I hope to be able to return next year, if only for the catering Then, I better attend some more talks and chat with the other guests. As in the last few years, the DFN Workshop happened in Hamburg, Germany. The conference was keynoted by Steven Le Blond who talked about targeted attacks, e.g. against dissidents. He mentioned that he already presented the content at the USENIX security conference which some people think is very excellent. He first showed how he used Skype to look up IP addresses of his boss and how similarly targeted attacks were executed in the past. Think Stuxnet. His main focus were attacks on NGOs though. He focussed on an attacker sending malicious emails to the victim. In order to find out what attack vectors were used, they contacted over 100 NGOs to ask whether they were attacked. Two NGOs, which are affiliated with the Chinese WUC, which represents the Uyghur minority, received 1500 malicious emails, out of which 1100 were carrying malware. He showed examples of those emails and some of them were indeed very targeted. They contained a personalised message with enough context to look genuine. However, the mail also had a malicious DOC file attached. Interestingly enough though, the infrastructure used by the attacker for the targeted attacks was re-used for several victims. You could have expected the attacker to have their infrastructure separated for the various victims, especially when carrying out targeted attacks. They also investigated how quickly the attacker exploited publicly known vulnerabilities. They measured the time of the malicious email sent minus the release date of the vulnerability. They found that some of the attacks were launched on day 0, meaning that as soon as a vulnerability was publicly disclosed, an NGO was attacked with a relevant exploit. Maybe interestingly, they did not find any 0-day exploits launched. They also measured how the security precautions taken by Adobe for their Acrobat Reader and Microsoft for their Office product (think sandboxing) affected the frequency of attacks. It turned out that it does help to make your software more secure! To defend against targeted attacks based on spoofed emails he proposed to detect whether the writing style of an email corresponds to that of previously seen emails of the presumed contact. In fact, their research shows that they are able to tell whether the writing style matches that of previous emails with very high probability. The following talk assessed end-to-end email solutions. It was interesting, because they created a taxonomy for 36 existing projects and assessed qualities such as their compatibility, the trust-model used, or the platform it runs on. The 36 solutions they identified were (don’t hold your breath, wall of links coming): Neomailbox, Countermail, salusafe, Tutanota, Shazzlemail, Safe-Mail, Enlocked, Lockbin, virtru, APG, gpg4o, gpg4win, Enigmail, Jumble Mail, opaqueMail, Scramble.io, whiteout.io, Mailpile, Bitmail, Mailvelope, pEp, openKeychain, Shwyz, Lavaboom, ProtonMail, StartMail, PrivateSky, Lavabit, FreedomBox, Parley, Mega, Dark Mail, opencom, okTurtles, End-to-End, kinko.me, and LEAP (Bitmask). Many of them could be discarded right away, because they were not production ready. The list could be further reduced by discarding solutions which do not use open standards such as OpenPGP, but rather proprietary message formats. After applying more filters, such as that the private key must not leave the realm of the user, the list could be condensed to seven projects. Those were: APG, Enigmail, gpg4o, Mailvelope, pEp, Scramble.io, and whiteout.io. Interestingly, the latter two were not compatible with the rest. The speakers attributed that to the use of GPG/MIME vs. GPG/Inline and they favoured the latter. I don’t think it’s a good idea though. The authors attest pEp a lot of potential and they seem to have indeed interesting ideas. For example, they offer to sign another person’s key by reading “safe words” over a secure channel. While this is not a silver bullet to the keysigning problem, it appears to be much easier to use. As we are on keysigning. I have placed an article in the conference proceedings. It’s about GNOME Keysign. The paper’s title is “Welcome to the 2000s: Enabling casual two-party key signing” which I think reflects in what era the current OpenPGP infrastructure is stuck. The mindsets of the people involved are still a bit left in the old days where dealing with computation machines was a thing for those with long and white beards. The target group of users for secure communication protocols has inevitably grown much larger than it used to be. While this sounds trivial, the interface to GnuPG has not significantly changed since. It also still makes it hard for others to build higher level tools by making bad default decisions, demanding to be in control of “trust” decisions, and by requiring certain environmental conditions (i.e. the filesystem to be used). GnuPG is not a mere library. It seems it understands itself as a complete crypto suite. Anyway, in the paper, I explained how I think contemporary keysigning protocols work, why it’s not a good thing, and how to make it better. I propose to further decentralise OpenPGP by enabling people to have very small keysigning “parties”. Currently, the setup cost of a keysigning party is very high. This is, amongst other things, due to the fact that an organiser is required to collect all the keys, to compile a list of participant, and to make the keys available for download. Then, depending on the size of the event, the participants queue up for several hours. And to then tick checkboxes on pieces of paper. A gigantic secops fail. The smarter people sign every box they tick so that an attacker cannot “inject” a maliciously ticked box onto the paper sheet. That’s not fun. The not so smart people don’t even bring their sheets of paper or have them printed by a random person who happens to also be at the conference and, surprise, has access to a printer. What a gigantic attack surface. I think this is bad. Let’s try to reduce that surface by reducing the size of the events. In order to enable people to have very small events, i.e. two people keysigning, I propose to make most of the actions of a keysigning protocol automatic. So instead of requiring the user to manually compare the fingerprint, I propose that we securely transfer the key to be signed. You might rightfully ask, how to do that. My answer is that we’ve passed the 2000s and that we bring devices which are capable of opening a TCP connection on a link local network, e.g. WiFi. I know, this is not necessarily a given, but let’s just assume for the sake of simplicity that one of our device we carry along can actually do WiFi (and that the network does not block connections between machines). This also prevents certain attacks that users of current Best Practises are still vulnerable against, namely using short key ids or leaking who you are communicating with. Another step that needs to be automated is signing the key. It sounds easy, right? But it’s not just a mere gpg --sign-key. The first problem is, that you don’t want the key to be signed to pollute your keyring. That can be fixed by using --homedir or the GNUPGHOME environment variable. But then you also want to sign each UID on the key separately. And this is were things get a bit more interesting. Anyway, to make a long story short: We’re not able to do that with plain GnuPG (as of now) in a sane manner. And I think it’s a shame. Lastly, sending the key needs to be as “zero-click” as possible, too. I propose to simply reuse the current MUA of the user. That sounds easy, but unfortunately, it’s only 2015 and we cannot interact with, say, Evolution and Thunderbird in a standardised manner. There is xdg-email, but it has annoying bugs and doesn’t seem to be maintained. I’m waiting for a sane Email-API. I mean, Email has been around for some time now, let’s now try to actually use it. I hope to be able to make another more formal announcement on GNOME Keysign, soon. Anyway, the event was good, I am happy to have attended. I hope to be able to make it there next year again. I had the opportunity to attend the 18th DFN Workshop (I wonder how that link will look like next year) and since it’s a great event I don’t want you to miss out. Hence I’ll try to sum the talks and the happenings up. It was the second year for the conference to take place in Hotel Grand Elysee in Hamburg, Germany. I was unable to attend last year, so I didn’t know the venue. But I am impressed. It is very spacious, friendly and well maintained. The technical equipment seems to be great and everything worked really well. I am not too sure whether this is the work of the Hotel or the Linux Magazin though. After a welcome reception which provided a stock of caffeine that should last all day long, the first talk was given by Dirk Kollberg from Sophos. Actually his boss was supposed to give the talk but cancelled it on short notice so he had to jump in. He basically talked about Scareware and that it was a big business. He claimed that it used to be cyber graffiti but nowadays it turned into cyber war and Stuxnet would be a good indicator for that. The newest trend, he said, was that a binary would not only be compressed or encrypted by a packer, but that the packer itself used special techniques like OpenGL functions. That was a problem for simulators which were commonly used in Antivirus products. He investigated a big Ukrainian company (Innovative Marketing) that produced a lot of scareware and was in fact very well organised. But apparently not from a security point of view because he claimed to have retrieved a lot of information via unauthenticated HTTP. And I mean a lot. From the company’s employees address book, over ERM diagrams of internal databases to holiday pictures of the employees. Almost unbelievable. He also discovered a server that malware was distributed from and was able to retrieve the statistics page which showed how much traffic the page made and which clients with which IPs were connecting. He claimed to have periodically scraped the page to then compile a map with IPs per country. The animation was shown for about 90 scraped days. I was really wondering why he didn’t contact the ISP to shut that thing down. So I asked during Q&A and he answered that it would have been for Sophos because they wouldn’t have been able to gain more insight. That is obviously very selfish and instead of providing good to the whole Internet community, they only care about themselves. The presentation style was a bit weird indeed. He showed and commented a pre-made video which lasted for 30 minutes out of his 50 minutes presentation time. I found that rather bold. What’s next? A pre-spoken video which he’ll just play while standing on the stage? Really sad. But the worst part was as he showed private photos of the guy of that Ukrainian company which he found by accident. I also told him that I found it disgusting that he pillared that guy in public and showed off his private life. The people in the audience applauded. A coffee break made us calm down. The second talk about Smart Grid was done by Klaus Mueller. Apparently Smart Grids are supposed to be the new big thing in urban power networks. It’s supposed to be a power *and* communications network and the household or every device in it would be able to communicate, i.e. to tell or adapt its power consumption. He depicted several attack scenarios and drew multiple catastrophic scenarios, i.e. what happens if that Smart Grid system was remotely controllable (which it is by design) and also remotely exploitable so that you could turn off power supply for a home or a house? The heart of the Smart Grid system seemed to be so called Smart Meters which would ultimately replace traditional, mechanical power consumption measuring devices. These Smart Meters would of course be designed to be remotely controllable because you will have an electrified car which you only want to be charged when the power is at its cheapest price, i.e. in the night. Hence, the power supplier would need to tell you when to turn the car charging, dish or clothes washing machine on. The next guy talked about Smart Grids as well, but this time more from a privacy point of view. Although I was not really convinced. He proposed a scheme to anonymously submit power consumption data. Because the problem was that the Smart Meter submitted power consumption data *very* regularly, i.e. every 15 minutes and that the power supplier must not know exactly how much power was consumed in each and every interval. I follow and highly appreciate that. After all, you can tell exactly when somebody comes back home, turns the TV on, puts something in the fridge, makes food, turns the computer on and off and goes to bed. That kind of profiles are dangerous albeit very useful for the supplier. Anyway, he committed to submitting aggregated usage data to the supplier and pulled off self-made protocols instead of looking into the huge fundus of cryptographic protocols which were designed for anonymous or pseudonymous encryption. During Q&A I told him that I had the impression of the proposed protocols and the crypto being designed on a Sunday evening in front of the telly and whether he actually had a look at any well reviewed cryptographic protocols. He didn’t. Not at all. Instead he pulled some random protocols off his nose which he thought was sufficient. But of course it was not, which was clearly understood during the Q&A. How can you submit a talk about privacy and propose a protocol without actually looking at existing crypto protocols beforehand?! Weird dude. The second last man talking to the crowd was a bit off, too. He had interesting ideas though and I think he was technically competent. But he first talked about home routers being able of getting hacked and becoming part of a botnet and then switched to PCs behind the router being able to become part of a botnet to then talk about installing an IDS on every home router which not only tells the ISP about potential intrusions but also is controllable by the ISP, i.e. “you look like you’re infected with a bot, let’s throttle your bandwidth”. I didn’t really get the connection between those topics. But both ideas are a bit weird anyway: Firstly, your ISP will see the exact traffic it’s routing to you whatsoever. Hence there is no need to install an IDS on your home router because the ISP will have the information anyway. Plus their IDS will be much more reliable than some crap IDS that will be deployed on a crap Linux which will run on crappy hardware. Secondly, having an ISP which is able to control your home router to shape, shut down or otherwise influence your traffic is really off the wall. At least it is today. If he assumes the home router and the PCs behind it to be vulnerable, he can’t trust the home router to deliver proper IDS results anyway. Why would we want the ISP then to act upon that potentially malicious data coming from a potentially compromised home router? And well, at least in the paper he submitted he tried to do an authenticated boot (in userspace?!) so that no hacked firmware could be booted, but that would require the software in the firmware to be secure in first place, otherwise the brilliantly booted device would be hacked during runtime as per the first assumption. But I was so confused about him talking about different things that the best question I could have asked would have been what he was talking about. Finally somebody with practical experience talked and he presented us how they at Leibniz Rechenzentrum. Stefan Metzger showed us their formal steps and how they were implemented. At the heart of their system was OSSIM which aggregated several IDSs and provided a neat interface to search and filter. It wasn’t all too interesting though, mainly because he talked very sleepily. The next day started with Joerg Voelker talking about iPhone security. Being interested in mobile security myself, I really looked forward to that talk. However, I was really disappointed. He showed what more or less cool stuff he could do with his phone, i.e. setting an alarm or reading email… Since it was so cool, everybody had it. Also, he told us what important data was on such a phone. After he built his motivation, which lasted very long and showed many pictures of supposed to be cool applications, he showed us which security features the iPhone allegedly had, i.e. Code Signing, Hardware and File encryption or a Sandbox for the processes. He read the list without indicating any problems with those technologies, but he eventually said that pretty much everything was broken. It appears that you can jailbreak the thing to make it run unsigned binaries, get a dump of the disk with dd without having to provide the encryption key or other methods that render the protection mechanisms useless. But he suffered a massive cognitive dissonance because he kept praising the iPhone and how cool it was. When he mentioned the sandbox, I got suspicious, because I’ve never heard of such a thing on the iPhone. So I asked him whether he could provide details on that. But he couldn’t. I appears that it’s a policy thing and that your application can very well read and write data out of the directory it is supposed to. Apple just rejects applications when they see it accessing files it shouldn’t. Also I asked him which protection mechanisms on the iPhone that were shipped by Apple do actually work. He claimed that with the exception of the File encryption, none was working. I told him that the File encryption is proprietary code and that it appears to be a designed User Experience that the user does not need to provide a password for syncing files, hence a master key would decrypt files while syncing. That leaves me with the impression that an enthusiastic Apple fanboy needed to justify his iPhone usage (hey, it’s cool) without actually having had a deeper look at how stuff works. A refreshing talk was given by Liebchen on Physical Security. He presented ways and methods to get into buildings using very simple tools. He is part of the Redteam Pentesting team and apparently was ordered to break into buildings in order to get hold of machines, data or the network. He told funny stories about how they broke in. Their tools included a “Keilformgleiter“, “Tuerfallennadeln” or “Tuerklinkenangel“. Once you’re in you might encounter glass offices which have the advantage that, since passwords are commonly written on PostIts and sticked to the monitor, you can snoop the passwords by using a big lens! Fortunately, Chritoph Wegener was a good speaker. He talked about “Cloud Security 2.0” and started off with an introduction about Cloud Computing. He claimed that several different types exist, i.e. “Infrastructure as a Service” (IaaS), i.e. EC2 or Dropbox, “Platform as a Service” (PaaS), i.e. AppEngine or “Software as a Service (SaaS), i.e. GMail or Twitter. He drew several attack scenarios and kept claiming that you needed to trust the provider if you wanted to do serious stuff. Hence, that was the unspoken conclusion, you must not use Cloud Services. Lastly, Sven Gabriel gave a presentation about Grid Security. Apparently, he supervises boatloads of nodes in a grid and showed how he and his team manage to do so. Since I don’t operate 200k nodes myself, I didn’t think it was relevant albeit it was interesting. To conclude the DFN Workshop: It’s a nice conference with a lot of nice people but it needs to improve content wise. Again, I had the great pleasure to attend the annual DFN Workshop which takes place in the Conference Center Hamburg (ever thought about, why they haven’t called it “Konferenz Zentrum”?). The first person to speak was a Dr. Neil Long from Team Camry and he spoke about the underground economy. They claim to research and investigate in that area and make deals with the criminals. He showed IRC logs most of the time and it was quite funny to see how the people interact with each other. They actually do speak 1337 and even I had a tough time reading their conversation He explained in great detail how the underground is organized. He claimed, that there are specialists for everything, everywhere. Programmers, Exploit-writers, Webhosts, Credit Card stealers, yadda yadda. Everything has it’s price and that is paid through various online money trasferring systems. This first-stage part opens an interesting attack vector to the wannabe hackers: Many Web Exploit Toolkits were infected with malware themselves. Because you have to run a strange smelling binary to create your first-stage excutable, you might run foreign malware yourself. I actually don’t understand, why this loader thing is such a big issue. I assume you could deploy your malware in first place without having it loaded through a staging program. The next interesting talk was given by the smart guys from Red Team Pentesting, which is a pretty interesting company actually. Former students founded that company and they do professional Pentesting. I have to admit, that I envy them a little. It must be a great job with a lot of interesting stuff to see. Anyay, they talked about jBoss insecurities. It seems that jBoss comes with development configuration and the people don’t change them to productive values but blindly bind their server to the network. It turns out that you can get shell access through nearly a handful ways, even if a smart administrator has locked some ways down. Also, many corporate or governmental site are driven by a jBoss server and -which is the interesting part- have a weak configuration. They have an interesting statistic that shows that only 8% of the JBoss servers out there are reasonably secure. How secure is the JBoss Web? I was actually bored by just one talk. It was about GRID Firewalls. While the topic is interesting in general, the guy made me fall asleep :- That’s a pity, because I believe he knew what he was talking about and had valuable information to deliver, especially due to his strong emphasis on practical problems. Maybe he can get his talk accepted next year and improve his talking skills. After the first day, we visited the Groeninger Braukeller which was a real blast! They have one of the finest beers I know of. Also the food in there is delicious. It’s a perfect atmosphere to get together and discuss the talks you’ve just listened to. I also took the chance to meet old friends which I haven’t seen for a while. Probably due to the massive amount of food and beer, I couldn’t sleep well that night and I thus was very tired the second day. I’ve listened to the talks but I couldn’t make it to the ModSecurity workshop It’s really annoying, because I actually wanted to attend that session! I do use ModSecurity at some projects and I think it’s a good tool. A reallife-relevant workshop would have been great. So, if you have nothing else to do on 2009-02-09, consider coming to Hamburg and enjoy the 17th DFN Workshop!